Home » Aragog Jr » Pets » Killing time with Aragog, Jr. Killing time with Aragog, Jr. I am always the type of person who prefers solitude, as hinted in my ABC profile over at Facebook page. Solitude brings me immortality (Lol, Matteo Rodriguez? Nope I am Stefan Salvatore, haha). I feel like I am invincible when I am alone (ofcourse, I am more safe and at peace with Me, Myself & I haha). Force of uncanniness seems to be manifesting as I have called it. Seriously speaking, I am not comfortable with a lot of people they simply suffocates me. And to top it all I am not a friendly person. I can stand for years sitting beside you without striking a conversation, that's for sure but ofcourse it's a total whole new story if you voluntary act as the friendly one. Most of the time people would perceive me of being snob and worst; other finds me, a person with attitude problems. I cannot really help them if I was born being a man of few words. Yes, I am a man of few words but when I'm on the net, well that again is another whole new story, lol. I don't know, I am not a loner I know how to party big time but I love to be alone. I love the comfort of silence and myself. My mother would always gave me that furtive looks, accompanying with words as she stormed my room when I'm home. "Don't you have any stories to tell us?" "How are you?" "Who are you dating right now?" or "When are we gonna hear about you getting married?" I'll just reply her with a "huh" while rolling my eyes with a grin in the face. But despite living under the solitary role, there comes a time that you will submit to boredom. And that is what happening to me right now. I'm trying to go online but damn my broadband is freaking slow, so slow I want to throw it very far that would reach solar system so its namesake would make her an ember of useless ashes, lol. 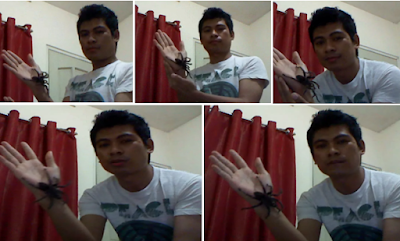 Ofcourse, I abandoned going online and instead turned on my web cam ahaha, and started cam whoring with my pet Aragog, Jr. The good thing about being alone is that despite acting the stupidest person in the world, no one would raise eyebrows or keep that inquiring and annoying looks. So ladies, gents and my faithful followers allow me to present to you the star of Halloween - Aragog, Jr and Me, lol. Ofcourse, you heard me blabbing about him in my previous post. Aragog, Jr is a chaco golden knee type of tarantula that my friend forcefully sold to me when he was 12-months old. He's very quiet like me so we're getting along together. So how about you? How do you cure your boredom?